It's almost time to send your kids back to school! Have you started your back-to-school shopping yet? At Hanna Andersson, you'll find fun backpacks, lunch bags, pencil cases, water bottles and more, to send your child back-to-school with a smile on their face! Hanna Andersson's backpacks for kids have awesome colors, sizes and monograms! Because kids backpacks for school carry everything they need all year long, Hanna Andersson crafts all of their packs and gear using heavy-duty, luggage-grade 600 denier polyester. Hanna Packs have lots of organizer details and every lunch bag is designed to hook to their backpacks for kids for super-easy carrying. Every detail is crafted to last clear through the year of busy days on the go. You can shop their backpacks for school collection to find backpacks, lunch bags, messenger bags, junior backpacks, rollie backpacks, pencil cases, water bottles, and lots, lots more (adapted from http://www.hannaandersson.com)! New at Hanna Andersson is Gear by Hanna & Friends! You'll find your kid's favorite characters like Elsa & Anna from Frozen, A few members from the Peanuts Gang, and even Star Wars legends! We're excited to help one of our readers send their child off to school with a stylish Hanna Andersson backpack and matching lunch bag! 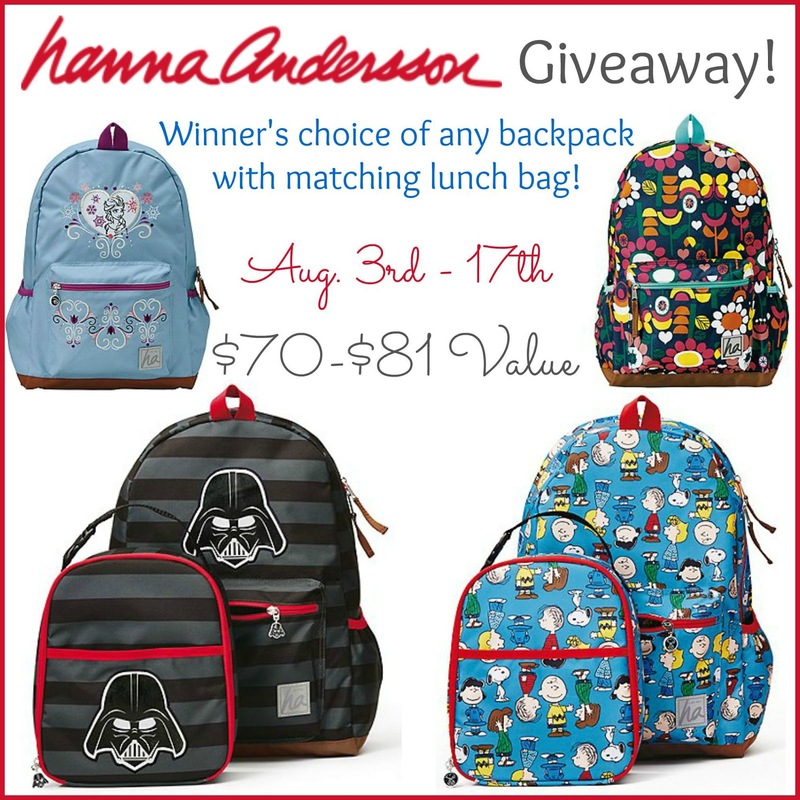 One winner will get to choose any Hanna Andersson kids backpack and matching lunch bag of their choice-- from the Hanna and Friends collection, or from their There & Backpack collection! There are so many great options your child will love! Macaron and russet there and here backpack is so cute. I like the Navy & Multi one. They are all really nice! I think my kiddos would love the Peanuts backpack the most!! They love all things Charlie Brown and Snoopy! I think the multi-leopard print would be a favorite of ours. Thanks. My son is a Star Wars freak so the Dart one for sure! I like the Bluest Sky/Navy boys backpack for my grandson. My daughter and I love the girls cheetah print backpack. It is her favorite pattern.